Mothers day is fast approaching - my17yr old has already given me my gift - she was never one with any patience LOL... dont know where she gets that from!! It was a huge surprise and the very first piece of jewellery she has ever given me... I love it!! Materials used: Borrowed the ef ages ago and dont remember the brand, EZ Cuts paper dies Love#1, Stampin Up Beautiful Wings die, cardstock & stickers from stash. Such a beautiful card! Love the hearts with that embossed background! 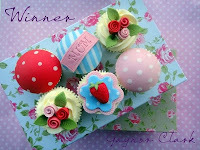 Thanks for playing along in the "Anything Goes" challenge over at the Simon Says Stamp challenge blog! Beautiful card - love the way you used the hearts - and the middle letter 'U' inside the heart seems to also say 'Love U' - very clever. And a gorgeous necklace too. I adore the way the pattern says MUM all the way round. Chosen with love and care and am not surprised your daughter was bursting to give it to you early. She has lovely taste! No wonder she wanted to give it to you early...it is so lovely! Sweet card...that embossing folder is fabulous. What a beautiful card, I'm sure your Mum will be delighted. Thanks for sharing with us at Scrapbook Boutique. You can never go wrong with jewellery lol. ps your card is wonderful, love the embossed background! Maudie what a beautiful necklace! Lucky you:-) Love that sweet embossed background on your card - yum! Lovely card. thanks for joining us at Scrapbook Boutique.